After my first investigation of romhacks, I was interested in diving in and actually trying to make one. Inspired by the recent surge in gender-swap hacks to promote positive female roles in video games, I considered doing something along those lines. What I ended up with was something a little bit different, but one that I think touches on how Theatre of the Oppressed can be used in the context of video games. 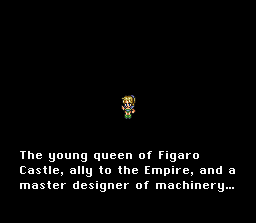 Final Fantasy VI Recast is an exploration of how narrative is effected by both audience preconceptions and what an actor brings to their role. All the playable characters have been recast. 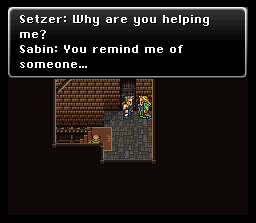 For example, the part of Edgar is now being played by Terra and the part of Celes is now being played by Setzer. The script is largely the same except for logic and gendered pronoun-related edits, but the statistics and equipment have not been changed. The only difference from the original game is, essentially, cosmetic. As I discussed earlier on this blog, our perceptions of a character are based on their uniform and mannerisms and, more importantly, what preconceptions we the audience bring in regards to that uniform. We see Shadow’s ninja costume and we know he is a deadly assassin with something to hide. We see Locke’s jaunty bandana, and when we hear he is a thief we think “oh he must be a dashing, Errol Flynn thief”. We see Terra as a young girl and see her struggle with not knowing or understanding affection within that context. This is the basis for many of those gender-swapping hacks I mentioned earlier. By changing the active hero and passive damsel’s gender it challenges the player to reconsider how they define those roles outside the game. 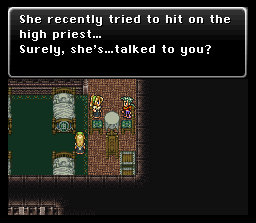 At first glance, Final Fantasy VI may not be the ideal game for this kind of hack. After all, it has a diverse cast and the main characters of its two acts are both female. Also both female characters wield swords, wear full armor and are extremely capable in battle and proactive in the story. However, they are still quite stereotypically gendered in other ways. Both Terra and Celes are given more “emotional” roles to play than their male fellows. Terra struggles with identity and love, but overcomes this after learning how to be a mother. Celes also struggles with the concept of love, and her attraction to/dependency on Locke. 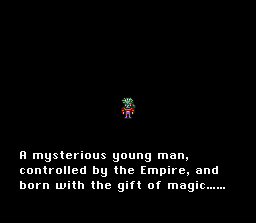 All of this makes perfect sense within the story and world of Final Fantasy VI, but you cannot remove that world from the context people bring in from outside the game. In the real world, ideas about a woman not being “whole” until she either becomes a parent or finds a man are used to oppress and control people. The game isn’t bad because Terra or Celes find meaning in these roles. No one is saying that women, or men, shouldn’t find meaning in those roles. But this doesn’t mean we can’t use the game to deconstruct roles that exist in our own context and go further. 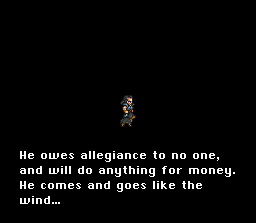 If Final Fantasy VI were a play, then how each actor played the part would drastically effect how the audience perceived the narrative. 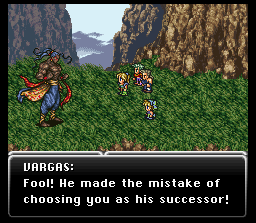 Final Fantasy VI was the first Final Fantasy to feature any effective “acting” from its sprites. 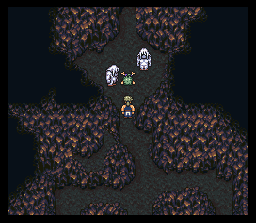 While still tiny, the character sprites are twice the size of those in the past Final Fantasies, and are therefore capable of a wider range of emotion and gesture. Characters have iconic poses and gestures, from Edgar’s flirtatious cape-twirling to Gau’s “sad puppy” crouch. But while each character acts “surprised” or “hurt” in a different way, the graphical data is all stored in the same place. By simply switching out one sprite sheet for another, its easy to recast a character in a different role and have them “act” in that role their own way. Another influence on this hack is the Star System of Osamu Tezuka. Tezuka had a collection of characters he would reuse in his comics. Most of the time, these characters would be used in the same kinds of roles. Hamegg looked like Snidely-Whiplash-meets-Peter-Loore and was almost always a villain. Other characters were more diverse, the most famous perhaps being Rock who started out as a child “actor” getting lead roles and later becoming a sullen teen playing mostly villains. Much later an adult Rock would be equally likely to appear as a hero or a villain, though he still “preferred” darker, psychological roles. Tezuka also had several “character actors” who could be called on to play any number of minor or major roles. Seeing a minor character like Boone or Lampe get a sudden lead role, especially a role they haven’t played before, is a thrill for Tezuka fans (ok, maybe just a thrill for me). Tezuka even treats them as actual actors, having them occasionally break the 4th wall outside of the comics and complain about typecasting or the quality of his work. Its a brilliant technique that allowed Tezuka to create hundreds of comics, films and tv shows starring characters the audience would easily recognize and understand at a glance, but also still be capable of subverting their expectations. 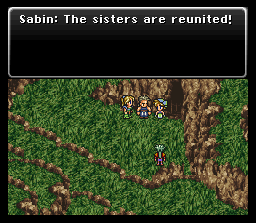 So using this as a model, the premise of this hack is that the story of Final Fantasy VI is like a stage production and the cast is just doing things a little different for this performance. So while playing the game, think about how your reaction to the narrative changes with this new “actor” and their interpretation of the source material. How does your view of the noble thief change when he’s a big, barrel-chested bear of a man? How does your view of Terra change when its the story of a shy young boy learning to love himself through nurturing others and becoming a father? How does your view of the royal siblings, one a shameless flirt and mechanical expert and the other a martial arts master on a mission of vengeance, change when its a story of sisters rather than brothers? How is the love story changed by making it no longer heteronormative? You can find the ips patch here. Use a program such as Lunar IPS to apply it to the Final Fantasy III (US) v1.0 rom (I will not supply the rom, don’t ask). UPDATE: It turns out there are several versions of this rom and not all of them work with the patch. I won’t link to any of the roms that work, but I will let you know that the Final Fantasy III US rom that works should be 2.14 mb large. Hint hint wink wink google. This post has already gotten long and pretentious, so if you’re interested in how I made this hack and what programs you can use to make your own, stay tuned for our next update. Also, let me know if you find any errors and I will do my best to update the patch. This entry was posted in Video Games of the Oppressed and tagged Emulation, Final Fantasy, Gender, jrpg, My Games, romhack, Square Enix, Super Nintendo, Theater of the Oppressed, Video Games of the Oppressed. Bookmark the permalink. This sounds like an amazing project and I’d love to give it a try. Unfortunately, I can’t seem to get it to work. I see weird graphical glitches and it appears to give enemies buggy attacks that wipe out my entire party. Is there more than one rom going around out there labeled US v1.0? Or is there something else I need to do to make it run right? Hi, sorry you’re having trouble. I haven’t had any problems with graphic glitches or enemy attacks like that, but I haven’t tested the rom extensively since I updated the patch to 1.1. Are you sure its 1.0 and not 1.1? If you have time, I can send you the previous patch (which only has a few incorrect pronouns) and you could try that with your rom and see if that works. Is anyone else having problems with this patch? The rom is 1.0, the patch is 1.1. Is there a link to the old 1.0 version of the patch so I can give that a try? Good news, I figured out what was wrong. Turns out there are several versions of the rom. I put a hint on where to find a copy I know works with this patch in the blog post. Based on the trouble I’ve had in the past getting translation patches to work. I assume that one version of the rom is headered and one isn’t, but I don’t know enough about how roms work to know if the working rom is which. I found a version of the rom labeled US 1.0 which is the exact same file size as the one in your blog post. Still doesn’t work, I’m afraid. It always freezes during the same spot in the intro. I’ve been told that if you do a specific search for a rom of that size the first result should be a site with a rom that works. Sorry for having to be vague. Give that a try. If that doesn’t work, try to search for one that doesn’t have a header. Yeah, I put “2.14 mb Final Fantasy III US” into the great googly googles machine and it came up with a result at the tippy top of the list that worked for me. A site that has “anime” in the name (Hope that’s not giving too many hints). Anyways, working for me and yeah… fun to see the way you shuffled the characters around in this hack. It does kinda’ alter your perception on things. I’m especially curious how this will effect the dynamics of the relationships that come up in the game. Anyway, you requested a heads up if any mistakes were found. 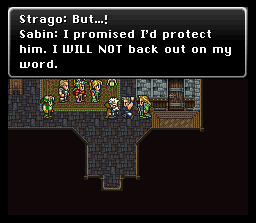 in Figaro Castle, after Gau has been sent to his room, Sabin refers to Terra with male pronouns. I’d have emailed you privately, but I’m afraid I fail at WordPress and couldn’t find contact info. This is beautiful and highly addicting! The shamelessly sexually fluid Terra flirting with the shy and demure sorcerer boy is just a delight. 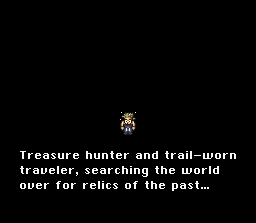 I am also playing the Celes + Terra hack of FFIV and I really hope ypu work woth some developers to do more simple but thought provoking hacks like this. I am a former lesbian activist and I am connecting to these characters in a strong way I never would have imagined. I hope Terra finds love so I can have my lesbian happy ending in both games. It’s impressive how thought provoking and amazing a game can become by switching character sheets and basically leaving the game itself untouched. I looked Return of The Dark Sorcerer, My Little Pony Fantasy, and this one. All of them are good but your version has me already to the Castle and playing nonstop!